Two small but very effective and most powerful Mahalakshmi Mantra Prayogas for getting the lifelong blessings of Mahalakshmi Devi and getting landed property have been described in this post. These Mantra Experiments are simple and easy to practice and even laypersons can easily practice them for fulfilling their wishes and desires. This wealth and abundance generating Mantra Prayog will attract all kinds of wealth and food and food grains and the practitioner will never have to worry about anything related to money and wealth in his life. The procedure given below should be followed in order to practice this Mahalakshmi Mantra Prayog. 1] The Mahalakshmi Mantra Prayog has to be practiced for only 3 days and it must be started on any auspicious date or festival. If that is not possible, then, starting the Mantra Prayog on a Friday is also considered to be auspicious and beneficial. 2] There are no fixed of specific rules for practicing this Mantra Prayog, but, it is most essential that the practitioner should use a yellow colored sitting mat, yellow colored clothes, yellow colored counting rosary. It is also essential that the practitioner should keep a fast for these 3 days and consume only those foods, which are usually prescribed for fasting and break the fast in the evenings and consume only Satvik or Pure Food for dinner. This practice should be followed for all the 3 days of the Mantra Prayog. 3] Then, the practitioner should light a Diya of Ghee and Dhoop and chant this Mahalakshmi Mantra 1200 times during these 3 days by chanting a fixed number of Mantra Chants per day. 4] After the completion of the Mantra Prayog, the Mahalakshmi Mantra should be chanted for 108 Mantra Chants daily, using a yellow colored Japa Mala. 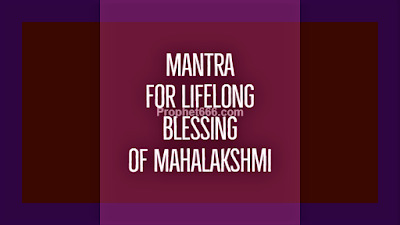 Another version of this Mahalakshmi Mantra, which is considered to be most powerful and effective is getting landed property of all kinds, like a house or land has been described below. As you can see only the “ Shreem – श्रीं " Beej is not present in this Mahalakshmi Mantra Prayog. The rules for practicing the Mahalakshmi Mantra Sadhana are the same as those that have been given for the Mantra Prayog described above. As is the first Mahalakshmi Mantra Prayog, the Mantra should be chanted for 1 Mala daily after the completion of the Mantra Prayog. 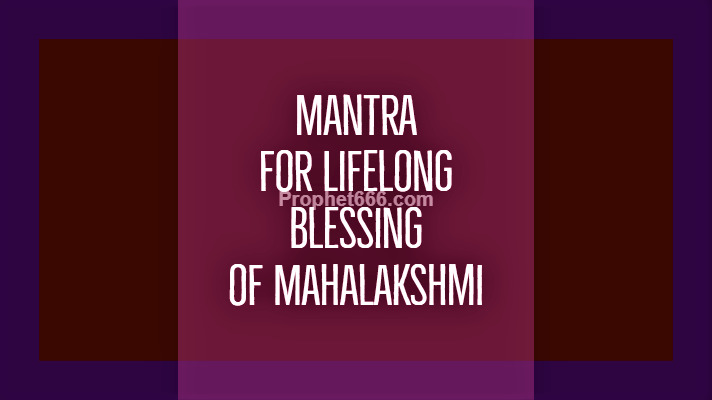 Notes- These Mahalakshmi Mantras will only help in fulfilling the legal and just needs of the practitioner as they are Satvik Mantras. The Practitioner can practice anyone of the two Mantra Prayogas described above, however, he can practice both of them one after the other, if so desired by him. Cleanliness and Hygene should be maintained by the practitioner throughout the 3 days Mantra Prayog. The practitioner should control his anger and not speak ill about other people or engage in gossip. नीलजी ,टंकण त्रुटि दिख रही है .महालक्ष्मे की जगह महालक्ष्म्यै होना चाहिए . (महालक्ष्मी शब्द का चतुर्थी विभक्ति (to /for )का एकवचन ). Thank you for pointing out the typing error, it has been rectified. Which mantra to be chanted to get a good job and prosperity. Neelji can we use kamalgatta rosary if we do not have yellow coloured mala .Also during the day fruits and milk can be consumed and in the night simple food without onion and garlic without much spice can be taken. Yellow Mala has been specially prescribed in the Tantra for this Mantra. During the day food that is normally taken during fasting can be consumed and after breaking the fast any veg meal can be consumed.